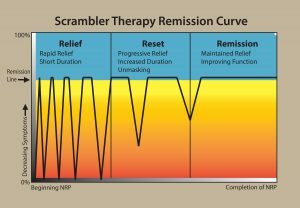 Scrambler therapy is a pain management approach that uses a machine to block the transmission of pain signals by providing non-pain information to nerve fibers that have been receiving pain messages. The first study on scrambler therapy was published in 2003 by a team of researchers led by Giuseppe Marineo, professor in delta research and development at University of Rome Tor Vergata in Italy. He and colleagues reported that scrambler therapy was effective at reducing pain symptoms in patients with severe, drug-resistant pain from terminal cancer. Scrambler Therapy is an electro-cutaneous treatment. Scrambler Therapy provides normal-self, non-pain electrical information via nerves that have been transmitting chronic pain information. Through a process termed plasticity, non-pain information is able to retrain the brain so that it does not ascribe pain to the chronic pain area. The Scrambler Therapy machine looks somewhat like an electrocardiogram machine. Leads are placed on patients, around the areas of chronic pain. Scrambled electrical signals are then sent to the brain that perceives them as normal, non-pain signals. Essentially, the brain is retrained to think that there really is not pain in the area that is being treated. At first, the pain symptoms go into remission for a short period of time, but after approximately 10 sessions, patients will experience continuous remission from pain. Remission will last from 3 to 9 months and when symptoms begin to return they can receive one to two booster treatments of Scrambler Therapy to make the pain go back into remission. Typically, the remission period increases after consecutive booster treatments. Ten 35-minute sessions of Scrambler Therapy scheduled on a daily basis, excluding weekends. The initial evaluation and program set-up costs $250. The cost of the Scrambler Therapy program is $3,250. The program includes 30 days of supportive nutritional supplements and ten 35-minute sessions of Scrambler Therapy. Additional sessions and booster sessions of Scrambler therapy are $300/session. After the initial evaluation and program set-up, patients receive the first session of Scrambler therapy at no charge. $3,250 is due in full before the second treatment. Patients who wish to seek reimbursement from their personal health insurance or health savings account are provided with a letter of medical necessity. If you wish to set up an initial evaluation to see if you’re a candidate for Scrambler Therapy, Call 952-933-5085 and request a Scrambler Therapy evaluation. Please bring any medical records you have that relate to your neuropathy or recent healthcare conditions.